So mommy’s been offline for a couple of days because she was hanging out by the Mandalay Bay pool in Las Vegas. Therefore, today’s entry will have two parts – 1) What happens when mommy’s away (or when she returns home) and 2) how mommy survived day 1 of Camp Mommy Part Deux! 1) During the one phone call that you make to home (night one you feel bad that you’re away, by night two you actually don’t remember you have children) your middle child just might say to you “mommy, guess where we are eating tonight . . . Hometown Buffet”. My husband saves up eating out at all the places he knows I won’t even pull into the parking lot for. 2) Somehow you are the only one who can smell that the dog has just made your home office a toilet and you are lucky enough to have smelt it so just as with the baby’s diapers, you get to clean it up. So, what did mommy do?! She promptly went to Bed, Bath & Beyond and bought the most expensive compact steam cleaning machine she could find. That one cost daddy $129!! Daddy’s lucky mommy used a coupon! 3) Yes, what happens in Vegas . . . stays in Vegas, but this one’s too funny not to share. Does anyone actually know what happens when it rains in Vegas? Yes, rain. On the one day that we were supposed to spend all day by the pool, it rained. Just a mother’s luck, right?! Well, just like any good momma, we made lemonade out of those lemons. I won’t tell you all the details, but let’s just say that we were 9 moms in a hotel room suite with a bunch of ‘I “heart” Jesus’ tattoos. Picture it . . . 9 moms in sin city with varying religious and ‘I “heart” Jesus’ tattoos. Nope, not gonna tell you where we put the tattoos. That part stays in Vegas! My trip was getting me prepared for Camp Mommy Part Deux (the last full week before school starts). Here’s what I learned about “the day after” the trip and getting “Gleek’d”! Smart@$& Superego put the wrong hand up, on purpose! 1) It is a bad sign when your 9 year old tells you that “mommy, you should close your eyes because of that girl’s clothes”. This statement was after Brittany S. Pears came out on stage in essentially a bra and booty shorts. Oooops, should have paid closer attention to the trailer on that one. 2) Your parenting may be questioned when your 4 year old is heard in public singing “dirty little freaks”. Is that a problem?! Shhhh, don’t tell Nana. 3) Your 9 year old may also inform you that when Michael Jackson sings “PYT” it’s ok for him to grab his crotch, but when Mike Chang does it, it’s disgusting. Exactly when she saw the video for “PYT”, I’m not sure. But, again, I’m not exactly sure I can argue that my parenting skills are stellar. Oh, here’s something I just discovered . . . my kids have been obsessed with the original Peter Pan movie with Cathy Rigby. Apparently in one of the scenes she and the lost boys crow like Roosters. I could not for the life of me figure out why my 4 year old has been crowing for the last 2 weeks. Now I know!!!! Seriously, I need to unplug the TV. Tomorrow, it’s day two of Camp Mommy Part Deux . . . Cupcake Wars. And speaking of, I need to find a recipe so as to kick BFF Molly’s @$&. 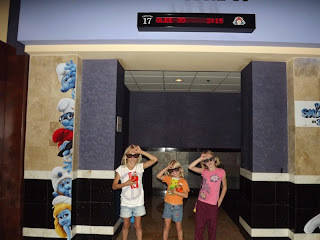 Glee was not nearly as good as the Hannah Montana concert movie, but it wasn’t horrible (although my 7 year old did say she was expecting it to be a movie, not just a concert). The Mandalay Bay pool is still the best in Las Vegas. The hotel rooms at THEhotel were very nice. The customer service at THEhotel by Mandalay Bay may actually be the worst in Las Vegas. We had varying issues from the wrong rooms to refusing to credit various charges to just plain rudeness. The rooms were very nice, but the service was just awful.